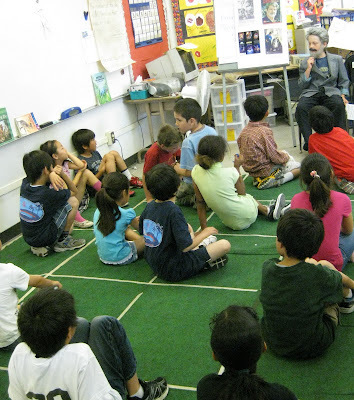 The big report for second graders is the "Someone Famous" report. It involves finding three resources and taking notes which are used to create a written report, a detailed visual report, and finally an oral report where the students dress up as their famous person and give the report as that person. 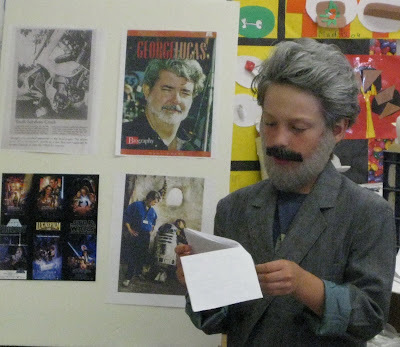 Nathan chose George Lucas. This ended up being an inspired choice as the parallels between George's childhood and Nathan's (so far) are quite pronounced. Both love comic books. George's dad actually had to build a shed to contain his collection! Both were intelligent but lackluster students, with wild imaginations. And both are creative but with a definite flair for technology. 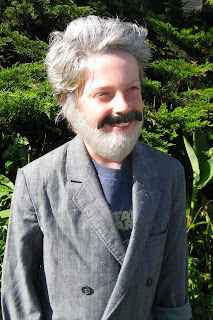 Today we all got up early to begin the transformation of Nathan as a eight year old boy into George, a 65 year old man. 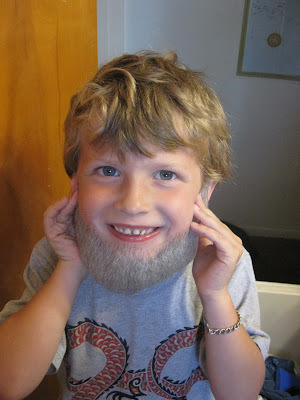 Nathan was most excited about the fact that he got to wear a real beard and mustache, applied with spirit gum. I also added some silver and grey hair color and did my best to turn his baby fine stick straight hair into a full head of big curls. It brought back memories of college and all the classes on hair and makeup and prosthetics. Nathan loved how it turned out! For his costume, I found a retro original Star Wars tee shirt and a 90's suit for a whopping $3.05 at the local Salvation Army thrift store. Glad that was cheap, as the human hair beard and mustache weren't! 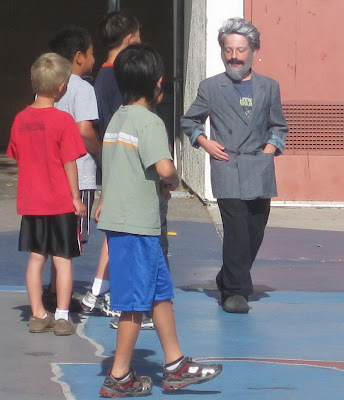 We all got to school where Nathan was treated like a rock star and his classmates asked for his autograph. And then one astute student pointed out that the oral presentations are next week, not this week. Oh NO! The school bell rang and his teacher walked over, to find me with my head buried in my hands, and poor Nathan with his arms crossed and head down. I have to say she handled my king-sized mix up with ease, excitedly telling the class (who were snickering at Nathan and the mix-up) that George Lucas was a special visitor this week instead of next. He started out shaky but came in strong. 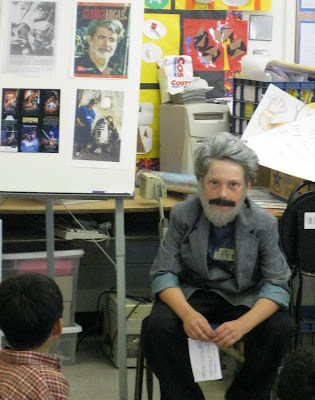 The best part was after the prepared speech was over and his classmates got to ask "George" questions. He answered them like a pro! All those weeks of study paid off! Go Nathan! And now next week he'll be cruising on easy street while his classmates fret over having to do their reports. What a week. I don't think I can handle any more excitement! 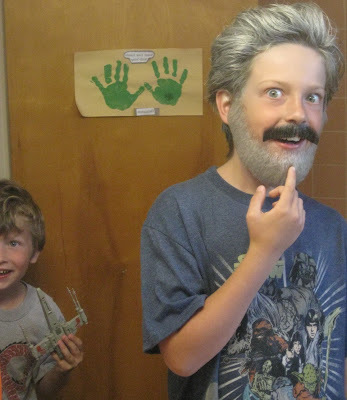 Applying the beard and mustache. Ben had to try it on, too.